This is a square Keystone Powerfuel porcelain sign. This particular Keystone Powerfuel sign is blue with white text. 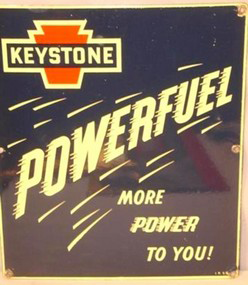 It reads, “Keystone, Powerfuel, More Power To You!” and features an orange Keystone emblem at the top left corner of the sign.